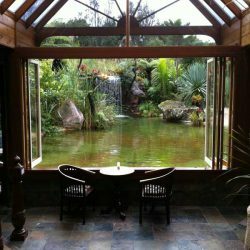 Experience the magic of Whitianga’s luxury Day Spa and Geo-Thermal Pools. 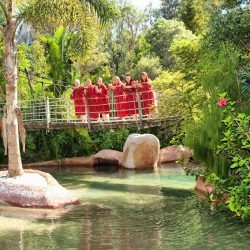 Wander through tropical gardens, relax amongst a New Zealand bush setting, and soak in 100%Pure thermal spring waters in sculpted pools. Map showing location of The Lost Spring . Use the controls on the map to zoom in and out. Nov 2012: My wife and I enjoyed 4 hours in this lovely setting. 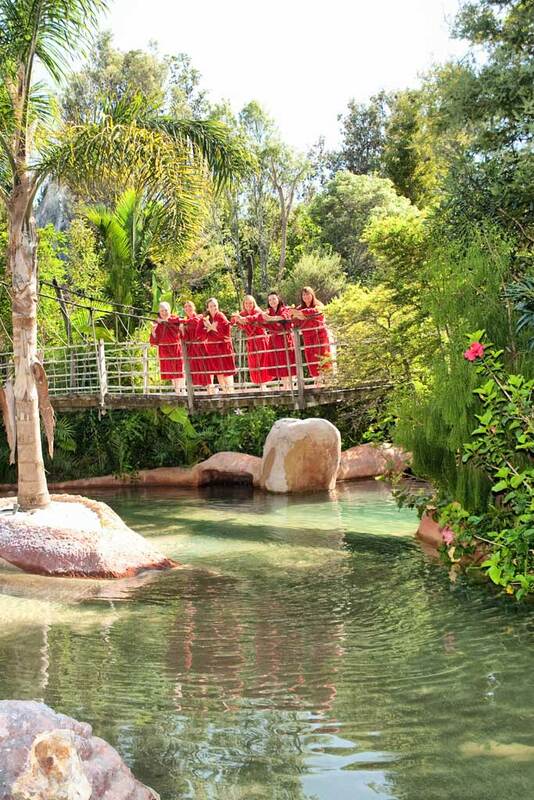 An enormous amount of work has gone into making this place a true oasis of relaxation. The poolside staff are friendly and attentive, and the pools themselves are delicious with a variety of temperatures to suit everyone. Thoroughly recommended. I visited with my boyfriend earlier this year. The atmosphere was wonderful, it really felt like a mini paradise. The only thing I would comment on is that there isn't many different pools to choose from and the water temp not quite hot enough. But, we were there on a very rainy day! And it was a lovely experience. Amazing place. The staff are friendly and professional, the facilities are top notch. And the no-kids policy is a huge drawcard if you want a relaxing and peaceful adults-only experience. Only drawback is the early closing hours, fine for winter when it gets dark earlier but at this time of year you don't get to experience the pools in the dark, which we would have loved to have done. 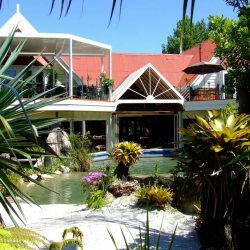 What a fantastic experience, on my 3 week "hot pool crawl" in the North Island. This is hot spring bathing at its finest. You can't help but be amazed at the planning and care that went into this facility - it has everything you could possibly want. I was quite concerned about this being a very commercial facility, and not "natural" but it certainly had its advantages. The ladies change rooms even had hair dryers and shampoo. The no kids policy was a refreshing change. I found the receptionist to be very polite and friendly. I was happy to book in for the day rate as I spent 4 wonderful hours there in the rain. I liked the really hot Crater Pool best, there were underwater benches at varying levels so you could sit in the depth that suited you; also a little waterfall there which was good for a massage on my arthritic knee. Even in the rain there were laminated menus around and the staff would come by occasionally to see if you wanted anything to eat or drink - I had a Pina Colada which was on special that day. Bliss! There is also filtered water available to stop you getting dehydrated. The jungle atmosphere was fabulous, as were the tuis flitting about, and the swim-in cave and even the gold leaves scattered on the "rocks". The only reason I can't give this a 10 is that the pathways were a bit slippery in the rain, it was hard to find somewhere to keep your towels & clothes dry and I found the larger pool quite difficult to get in and out of with slippery concrete - no handrails for those of us who are slightly incapacitated. However I would happily return and next time I will spend the whole day; it was just fantastic. A amazing, peaceful, relaxing setting and loved the poolside service. Can't wait to go back! These owners know what they're doing by keeping the entry at a high price. You get quality service, beautiful surroundings and no little kids running around. We left ours at home to enjoy these pools especially! Tranquil surroundings, friendly staff constantly at your service, the most luxurious changing rooms I've been in. Better than the 5 Star Hotels in Auckland! The place reminded me of a resort I stayed in when holidaying in Samoa and another one in Singapore. Top class facility. Keep up the good work! 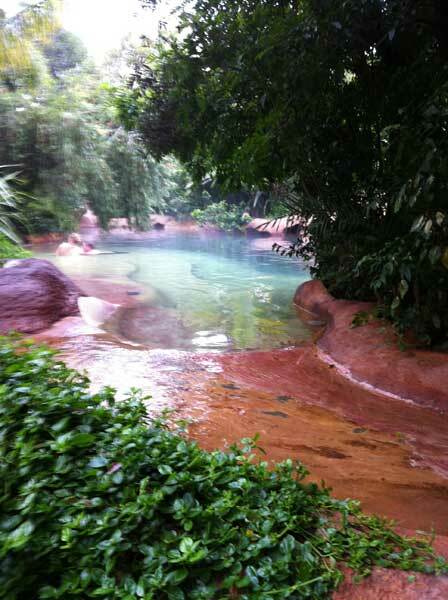 A magical place combining a jungle like environment with hot pools. Not many pools and very expensive - at the end of the day, it's the same water as other hot pools at around double to 4 times the price. The only pool of value was the Hot Crater, the other pools were not hot enough. As a whitianga part time resident, I brought 4 members of my family visiting from Scotland to visit the lost spring , they were just amazed at the setting from walking off the suburbian street to a tropical paradise - Fantastic. I love this place! It feels like you're on a tropical holiday! I found they were quite lax about the 1 hr time limit (I guess it depends on visitor numbers?) I was pregnent at the time & the large pool was the perfect temp! The hot pool was beautifully constructed, like something you'd see in a movie! Loved it, loved it, loved it! It's nice but very annoying pricing. You can pay for one hour or the whole day. Nothing in between. They watch you to make sure you don't exceed your time. So not relaxing at all as you have to keep watching the time. It would be a truly awesome experience if they would change their charging method. Best thermal pools in the country + VERY VERY Friendly owner!!! Very clean and tidy, romantic and nice facilities. We will be back!! We had the most fantastic time. We paid for an hour but the owner (who is really friendly) said we were welcome to stay longer. Sadly we couldn't as it was getting dark and we had a long drive back to our accommodation in Coromandel township. All the lights were being lit just prior to us getting out - magic! I really appreciated the complimentary cool water beside the hotter pool there is also soap and shampoo in the showers. All the staff were friendly and courteous which was nice since we arrived muddy, wet and dishevelled after a long bush trek in the rain not to mention cold - that was soon fixed though! After a lovely soak in the hotter pool it was heaven to slip into the more tepid, larger pool. Even in there you could find hot spots if you wanted a little more warmth. Best things about the Lost Spring include; no young kids so very couple orientated, lots of space and privacy create a very romantic ambience and the water leaves your skin felling wonderful! Iâ€™m already planning a return trip and we will get an all day pass which will allow us to explore the gardens fully, sample the food, maybe have a massage from the spa and consume a cocktail or two. Just have to find accommodation we like in the vicinity and weâ€™ll be back!! 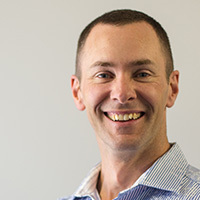 Thanks Alan for persevering with your dream, it is definitely a worthwhile outcome! went there with my partner and we had the best time.. adults only so it was lovely to have some peace and quiet.. romantic setting with serene music playing. waterfalls and hidden caves.. reminded me of a balinese garden. complimentary tropical fruit was available to us so we had some pineapple and watermelon to go with our fresh cocktails as we lay in the water.. great atmosphere for new lovers.. and the shower area was equipped with shampoo conditioner and blow dryer and straightener.. so big thumbs up for the ladies.. the staff were very helpful and friendly.. loved it loved it loved it. I also found the receptionist a bit rude. Nevertheless, it is a great place but you get the felling it is still a work in progress and therefore it needs to be priced accordingly. 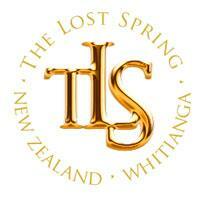 The lost spring is truly a place to remember!! The ambience is magical. It's a must see at night. There is simply no place in the North Island like it for me so far. Well done Allan and thank you for this marvelous gift.. keep up the good work team. we can't wait to return!! Best thermal pools in the country. And I've been to them all! Magical at night time- rain or shine-a true treat after a day seeing the sights of the peninsula. A very special place to visit. The service, the style and the romantic setting were out of this world. A "magical" place! We called on Sunday 6/9/2009 and were not impressed by the receptionist. She was very unfriendly and if it was'nt for us coming to have lunch with an old school friend who had made a booking a few of us would have walked out. As it was one of the group decided to eat elsewhere. To put it briefly we weren't made to feel welcome and won't return. 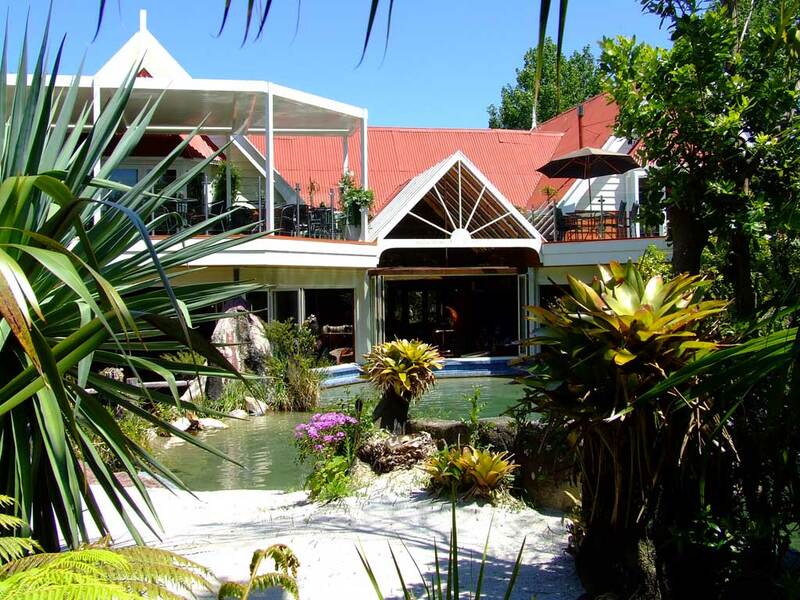 Whitianga's luxury thermal pool complex, day spa and restaurant. 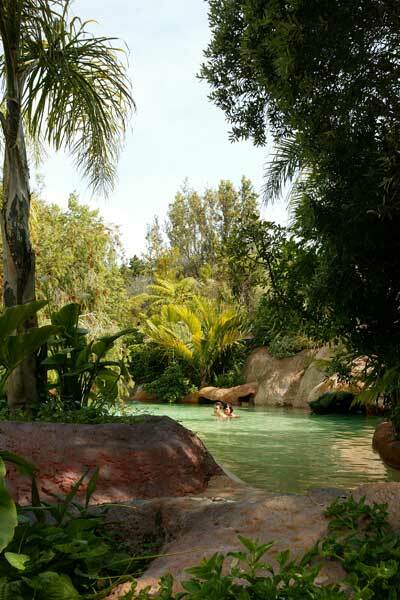 Sculpted pools surrounded by gorgeous gardens of native and tropical plants. Swim for an hour or stay for the day. 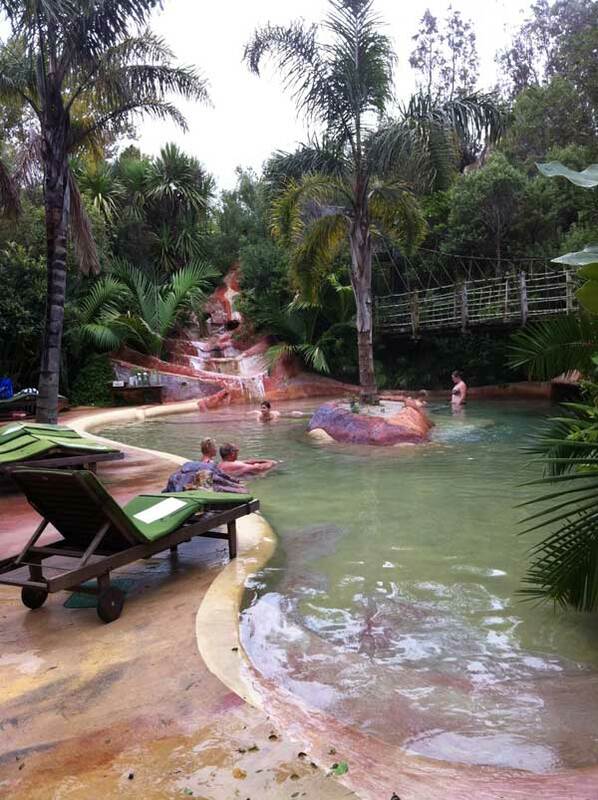 Probably one of the best commercial thermal pools in NZ. The setting is gorgeous and the water is great. Your skin feels fantastic afterwards. The Day Spa is lovely and the food in the restaurant first class. Fantastic! must see in NZ, WORLD CLASS! This facility is 5 star all the way. Adults only with bar service, great resturant, amazing gardens and full spa treatment menu. You get what you pay for, this is a real treat. Can't wait to go again. A fairly modern complex with 2 main hot pool areas. The larger swimming pool has a long cool curve with a 'hidden' cave fully equipt with electric 'glow worms' and geode encased stalactites. The waters at this end are pleasingly tepid. At its deepest point it's around chest height but the shallows are child friendly gentle slopes. Swimming up the gentle current under a bridge leads to the warmer mini hot pool where you can relax and sip your choice of a selection of alcoholic drinks - although the cocktails are a little pricey. Payment is by account number on your wrist band. Wander down a wee path through the bush and you'll 'discover' the smaller but much hotter sequence of 3 interconnected pools. The concrete 'cliffs' with embedded gold tiles leave you thinking of an aztec influence however the birds are far from shy and Tui's are clearly at home amidst the bathers. 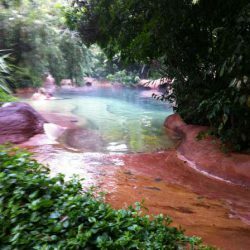 The Lost Spring is not just a hot pool it is a magical experience in itself. Although in Whitianga when you drive in those big gates you are stepping into a tropical paradise. The pools have been made with love and passion and that is truly visible. Heaps of character and class. Wonderful place to spend time with friends. The restaurant is also highly recommended. 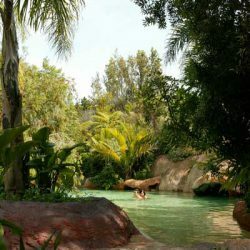 A luxurious collection of hot pools with beautiful surroundings - palm trees and tuis - crystals embedded into the labyrinth of caves between the pools. 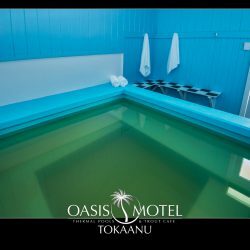 The temperature of the pools range from 30 - 42 and this is a nos under 14 thermal park with an excellent restaurant attached as well as the pure indulgence spa. Just spent a day there - it was bliss. 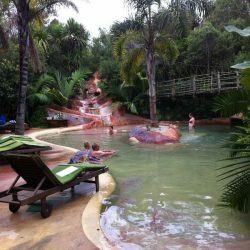 Called in to have a look when passing through but no time for a swim.This place would have to be the most magic one in the country.It is like a fairy land.All nice and new and tastefully set up.Great variety of pools and lovely bush walk.Has a neat cafe as part of the complex. Beautiful setting in paradise. My husband & I forgot our swim togs but we were able to purchase nice new ones at a reasonable price. Would definitely recommend a visit. this is the most amazing hot mineral pools complex I have ever seen.. luxurious trees/plant growth/tuis everywhere/adult only facility/just like Hawaii, 10 out of 10!. magic. Fantastic experience, friendly staff, great service. Pools were beautiful and clean, imaginatively set amongst natural vegetation, with varying temperatures to alternate between. Highly recommended! A real piece of paradise tucked away in the little town of Whitianga. 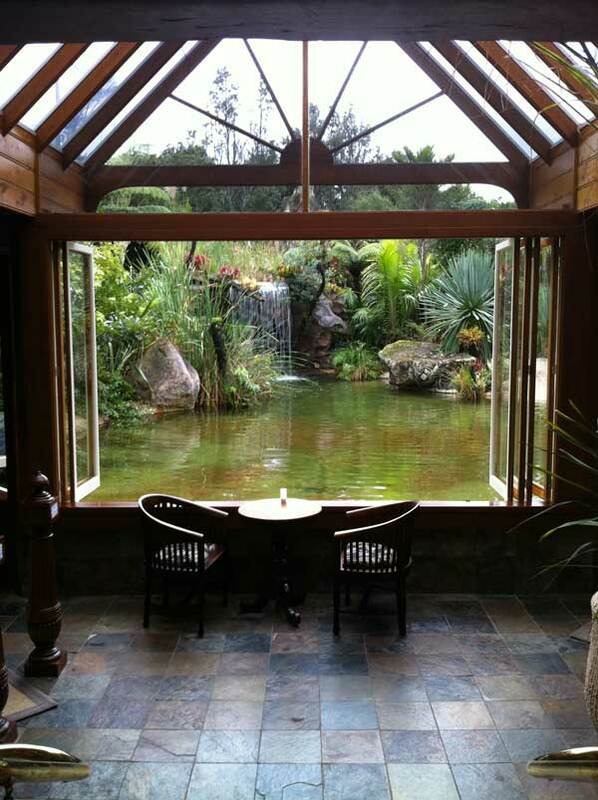 Probably the best and most luxurious geothermal pools in NZ. Crystal clear water, a fabulous bush setting. Excellent restaurant and a popular day spa for massage and beauty therapy. Great story which featured recently on TV3 and on cover of AADirections magazine.